I'm going to start off by acknowledging that this effect is not everyone's cup of tea. In fact, I know some photographers that cringe every time they see it. Nevertheless it is a look that many people do like and therefore to forward the world of art, I think it's prudent that I make a post so that people can make that choice for themselves. Diffraction spikes are created when the incoming light (acting in wave nature) diffracts (essentially bends) around a small object in the path of the light. In a reflecting telescope the diffraction is created by the rods (Struts or Veins) that hold the secondary mirror. In a camera lens, the diffraction is created by the small "out of round" opening created by the diaphragm blades of the lens. So there you go, now you have an understanding as to what creates the spikes. I'm also sure you know understand why SOME people do not like them. They are in fact an artifact or a flaw in an image. Albeit on that is pleasing to many eyes. OK Darryl, enough of the physics lesson, get to the spikes!!!!! Creating the spikes is very, very, easy with the aid of Photoshop. Lets start with an image from my archives. 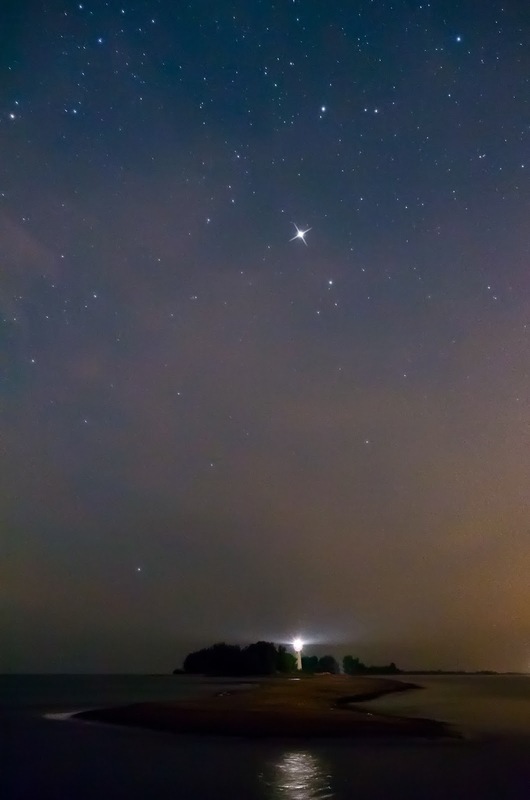 With this image, both the Lighthouse and the "Star" (I actually think it was a planet) are to be the focal points. I thought an appropriate name for this shot is "The Twin Beacons". Both the lighthouse and the star are very bright, but since the lighthouse overpowers the star we need to accentuate the star so that it catches the eye of the viewer a bit better. In comes the spikes! On this particular image we will add a star spike to the bright star above the lighthouse. Under the "Windows" menu click on "Brush Presets"
Once the Brush window opens you will see a drop down menu in the upper right corner of the brush menu. Activating it will bring up a list of the brush presets you have. In this case the desired brush is found in the preset named "Assorted Brushes"
The particular brush that we will be using in this image is "Crosshatch 1", which is found 4 or 5 brushes down and looks like an "X". Don't forget to play with the Opacity, Flow, and Size of the spike. This vary the brightness and size of the diffraction spikes. Do yourself a favor and play with on a LAYER. That way you won't destroy all your hard work by making a mistake. Before using the brush you should also take a color sample of your star. That way it will be a matching color and will look more "realistic"
Once that is done, use the zoom tool to zoom in very close to the star. Center the brush on the star and start brushing. Do not however move the cursor or you will not get the desired effect. I hope that you found this tutorial informative and helpful. Good luck shooting and I hope you have "Dark Clear Skies"